Unlike some of her superfriends, Wonder Woman's New 52 run was exceptional and rather unique. I enjoyed Brian Azzarello's nearly unfettered approach to the iconic character, contradicting her canonical origin and surrounding her with a dysfunctional family of gods. Seeing the Amazon princess though Cliff Chiang's wonderful art was a treat for the eyes. As special as that was "Rebirth" is about honoring the past, going back to fundamentals, and reintroducing legacy heroes in the best ways possible. Greg Rucka and Liam Sharp are here to do just that in 'Wonder Wonder' #1. 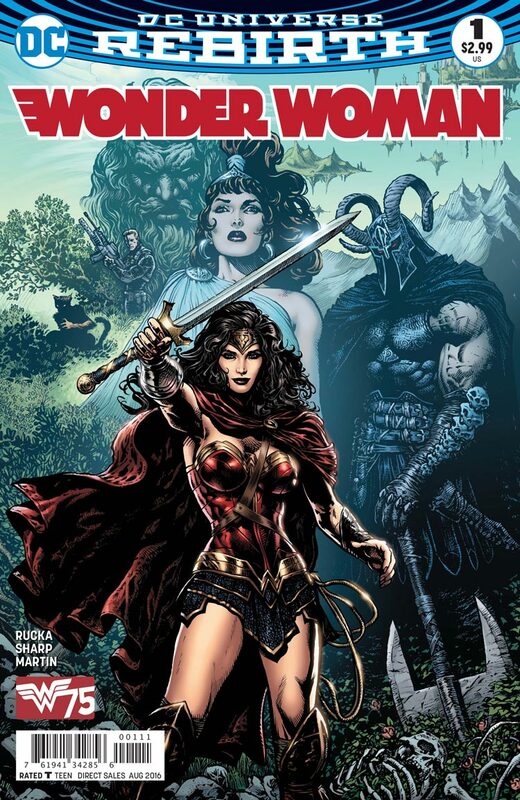 Rucka returns to write Wonder Woman with a deliberate slow-burn narrative that is reverential and elegantly spartan. A writer as seasoned and as talented as Rucka knows when to let his artists shine and Liam Sharp and Laura Martin lead the way as the issue opens up with Wonder Woman searching through a rainforest. Sharp's Diana is statuesque, muscular, and graceful. Her costume is like that of Gal Gadot's from Batman V Superman. She's classy and confident with a regal demeanor. There are echoes of George Perez in Sharp's lines only fuller, more rounded, and softer in some ways. She commands the page like a powerful heroine should. Martin saturates the panels, especially in the jungle scenes, with lush rich earth tones. The transitions from eerie jungle to dark command center to dry war zone are varied but fluid. The facial expressions from Commander Etta Candy say plenty without a word, her freckles endearingly prominent, and body language that conveys a cool confidence. Sharp is as taken with Etta as are her fans. While Diana searches the jungle for a surprising ally, Etta checks in on Steve Trevor who's leading a team trying to track down a dangerous warlord. Their interaction reveals a shared history with Diana. Rucka cleverly covers these connections to Diana in a natural way through dialogue and without exposition. It's clear that Etta and Steve played an important role in her life and Rucka establishes these relationships concisely. 'Wonder Woman' #1 demonstrates a level of reverence and understanding of the iconic Amazon that harkens back to long before the New 52. She is graceful but fierce when needed and the epitome of class and calmness. Rucka has created a Wonder Woman we can be proud of and under the artistic hands of Sharp and Martin she's never looked better. The stage is set for more action and adventure with a debut issue that hooks you in.